(COVINGTON, La.) With the plethora of activities, clubs, and sports found at St. Paul’s, notable extracurriculars often get hardly any publicity. One such extracurricular is that of the St. Paul’s Ultimate Frisbee® Team, the Dire Wolves. Since the team’s start at St. Paul’s in 2003, the Dire Wolves have consistently done well, often finishing in the top five in the state. Despite the team’s many successes, however, most people know very little about it. For instance, the Ultimate squad’s schedule is unlike most sports teams at St. Paul’s. The fall season, which lasts from late August to early November, consists of tournaments around the state but does not include an official state tournament. The spring season lasts from late February to around the end of the school year. This season consists of tournaments throughout the state and ends with a state tournament that determines the final standings of all the teams in Louisiana. The Dire Wolf consists of a Junior Varsity and Varsity team. Collectively, both teams consist of around 20-30 active members. Since James started playing in 2013, the varsity team has placed 2nd in state (2013), 3rd in state (2014), and 4th in state (2015). The team did not get to compete in the state tournament last year due to scheduling conflicts. 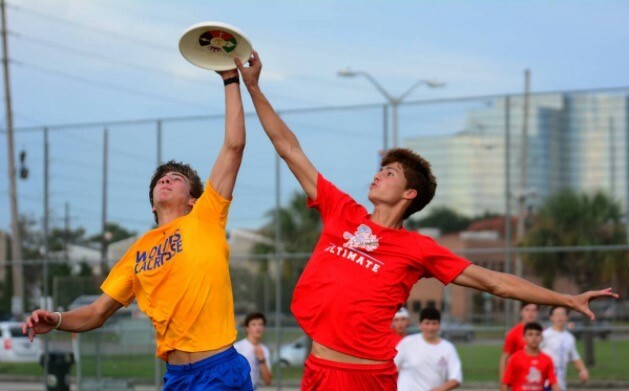 The Baton Rouge-based Catholic High team, a rival of the Dire Wolves, recently won the 2017 national tournament for high school Ultimate Frisbee. At the Beowulf Ultimate Frisbee tournament held on St. Paul’s campus this past Saturday (Oct. 21), the Dire Wolves lost to Catholic High 11-2. The Dire Wolves practice on Tuesdays and Thursdays from 3 p.m. to 5 p.m. on the varsity soccer fields. The team encourages students of all grades to attend a practice if interested in playing.